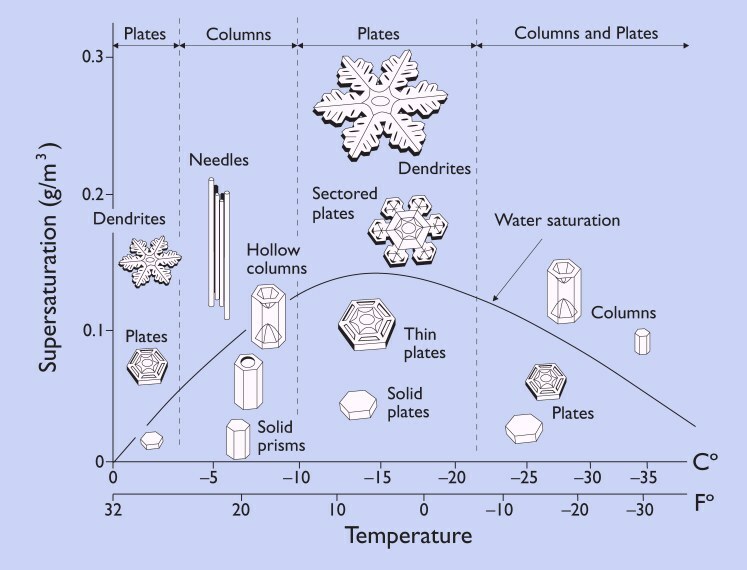 As you learned in the Snowflake Primer, the shape (morphology) of snowflakes is dependent on climatic conditions. Figure 5.3: Snow Morphology Diagram. This snow morphology diagram illustrates how temperature and humidity (or supersaturation) affect the shapes of snow crystals. You can engage your students in predicting the shape of snowflakes by collecting data on temperature and humidity whenever it snows, using the snow morphology diagram. Then have them examine freshly fallen snow crystals using a hand-lens. In addition, the shapes of snowflakes when they are fresh differ from the shapes when snowflakes have been on the ground for a period of time. Students can make observations of the shapes of snow crystals in the layers of snow. If you have deep snow, dig a snow pit, so that students can compare the shape of snow crystals in layers of snow from the bottom to the top. The following diagrams provide information on the types of changes you can expect to see as snow crystals accumulate on the ground over time. Figure 5.4: Equi-temperature metamorphosis refers to the changes that occur to snow crystals over time in deep snowpacks, when the temperature at the surface of the snow and the temperature at the base of the snow are virtually the same. This generally occurs when air temperatures remain close to 0 degrees Celcius for an extended period of time. Figure 5.5: Temperature gradient metamorphosis refers to the changes that occur to snow crystals over time in deep snowpacks, when the temperature at the surface of the snow is significantly colder than the temperature at the base of the snow for a period of time. This is most apparent when air temperatures are between 0 and -40 degrees Celcius. Due to the insulating properties of snow, the base of a deep layer of snow will remain higher than the air temperature in these conditions.